A consortium of conservation groups – the National Resources Defense Council, the Wildlife Conservation Society and SeaWeb – started a campain “Caviar Emptor – Let the Connoisseur Beware” that in December 2000 published a report under the title “Roe to Ruin“. The report emphasized the near extinction of sturgeon and proposed to stop all international trade in beluga. Based on that report, the consortium filed a petition with the U.S. Fish and Wildlife Service to list beluga sturgeon (Huso huso) as an endangered species pursuant to its authority under the Endangered Species Act of 1973 (ESA). On April 20, 2004 the U.S. Fish and Wildlife Service announced that it would list beluga sturgeon as a threatened species. However, the special rule that would govern the trade in beluga caviar was not proposed until June 29, 2004. Although it allowed the import of beluga products from the Caspian and Black Sea range states, it did not exempt the trade in live or commercially raised beluga sturgeon. It banned the “import, export, re-export, or interstate or foreign commerce involving any beluga sturgeon products that originate from aquaculture operations outside the range countries” without a threatened species permit in addition to any applicable CITES documents. Formulated this way, the rule effectively banned any beluga aquaculture in the United States. Written comments submission period for this rule ended on July 29, 2004. On October 21, 2004 the publication of the final rule was postponed by the USFWS until January 2005, and the interim rule that preserved the status quo was published instead. On July 23, 2004 the representatives of the Florida Sturgeon Production Working Group met in Pierson, Florida, at Evans Farm. The meeting attended Mr. Michael Salario, Assistant Deputy Commissioner of the State of Florida Agriculture Commissioner; Mr. Mark Berrigan, Bureau Chief of the Bureau of Aquaculture Development, Division of Aquaculture of Florida Department of Agriculture; Dr. Stephania Bolden of National Marine Fisheries Service; Mr. John Field of the USFWS, as well as representatives of the Florida aquaculture community. To see pictures from the meeting, please click here. On March 4, 2005 the USFWS published a final version of the Special Rule to Control the Trade of Threatened Beluga Sturgeon. According to that rule, international, foreign and interstate commerce in beluga sturgeon meat and caviar are exempt from permits normally required under the ESA. 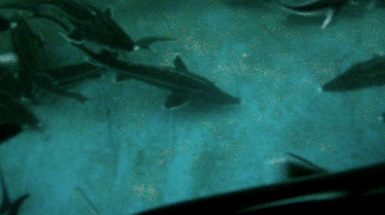 The special rule also conditionally exempts aquaculture facilities in countries without native populations of beluga sturgeon, such as the United States, from the Act’s threatened species permit requirements, provided they comply with several requirements (demonstrate the impossibility of sturgeon escaping into the wild, show cooperation with the countries in the species’ range in study and restoration of the native sturgeon populations). To see the full text of the special rule, please click here. Below are several letters written to the USFWS from various American and foreign organizations in support of making exceptions for research and culture in the listing of beluga in the ESA. Federal Register Notice. March 4, 2005. Special Rule To Control the Trade of Threatened Beluga Sturgeon (Huso huso). U.S. Fish & Wildlife Service issues special rule to allow trade in threatened beluga sturgeon. March 4, 2005. Federal Register Notice. October 26, 2004. Interim Rule for the Beluga Sturgeon (Huso huso). U.S. Fish & Wildlife Service issues an interim rule for threatened beluga sturgeon. October 21, 2004. Federal Register Notice. April 21, 2004. Final Determination of Threatened Status for the Beluga Sturgeon (Huso huso). Federal Register Notice. June 29, 2004. Special Rule To Control the Trade of Threatened Beluga Sturgeon (Huso huso). Beluga sturgeon may join threatened-species list. By Ludmilla Lelis. Orlando Sentinel, April 21, 2004.